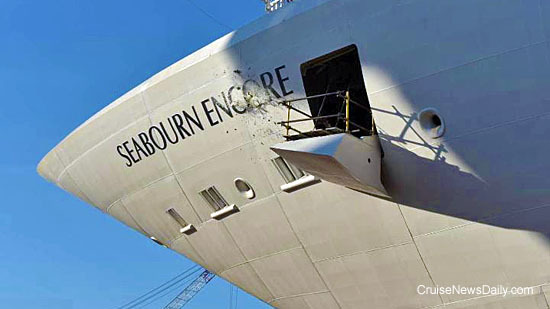 Seabourn Encore touched water for the first time today in Marghera, Italy, a major event in the building of a ship because, for the first time it is doing what it was built to do - floating. Once the drydock fills with water, the new ship will be towed to an outfitting dock in the Fincantieri yard where the interior will be completed over the next six or seven months. The water began to flow today when Marnie Tihany, the wife of the ship’s interior designer and today, the ship’s madrina, cut a cord which allowed the ceremonial bottle of champagne to smash against the ship’s bow. Details appeared in the March 4 edition of Cruise News Daily. The bottle smashes against the bow of Seabourn Encore and the water begins to flow into the dry dock. Photo courtesy of Seabourn Cruises. All rights reserved. May not be copied or used without permission. As Celebrity’s Millennium-class ships are cycling through dry dock, they are returning to service with several new features, but one, the Rooftop Terrace, enables the line to provide a new evening event called “A Taste of Film” that has already proven a hit aboard Celebrity Infinity. The complete story appeared in the March 4 edition of Cruise News Daily. Photo courtesy of Celebrity Cruises. All rights reserved. May not be copied or used without permission. It sounds like something out of a sitcom, but this really happened yesterday aboard Independence of the Seas, and is a quite serious situation. According to the Sun Sentinel, a woman brought a bottle of champagne aboard the ship, apparently to toast the beginning of her vacation. The cork apparently got away while the bottle was being opened and struck the woman in the eye. The Walt Disney Company said today they have signed a memorandum of agreement with Meyer Werft to build two ships for Disney Cruise Line. Delivery is scheduled for 2021 and 2023. P&O Cruises Australia said today that Pacific Pearl has been sold and will leave the fleet next spring. The 63,786-ton ship has been part of the P&O Australia fleet since 2010, but in the years since it was built in 1988, it has become the favorite of many under several names sailing for five different brands. At the height of the cruise line building boom, cruise lines all expressed concern that they might not be able to get slots for their orders at shipyards when they needed them, so they worked around this by ordering ships farther out than they really wanted to, just to ensure they could get a slot which they could later trade between brands they owned. Genting Hong Kong which is building ships for its three brands (Crystal, Star and Dream), today announced the acquisition of Nordic Yards’ three shipyards in Wismar, Warnemunde and Stralsund (Germany) for 230.6 million Euros. Genting’s CEO, Tan Sri Lim Kok Thay, said the action, along with their recent acquisition of Lloyd Werft, will ensure that Genting could build the number of ships they will require over the next decade on their time schedule. Fincantieri said today they have partnered with Huarun Dadong Dockyard at Shanghai to create a cruise ship repair and servicing facility to service the growing number of cruise ships based in China. Norwegian Cruise Line has raised the prices of most of their dining and beverage packages. CND subscribers also read about an interesting twist P&O Australia put on a theme party that may surprise American passengers at first. Koningsdam has returned to the Fincantieri yard at Marghera from its sea trials, and Capt Emiel de Vries talks about it and his “office” aboard the ship - the bridge - in the sixth episode of the Countdown to Koningsdam video series. The Greek port of Santorini has always been a very popular port, but you may be finding it on fewer cruise itineraries in the future. It seems it’s a victim of its own popularity. Authorities on the island have decided to limit the number of cruise passengers who may visit the port each day to 8,000. Passengers sailing on Norwegian Escape’s eastern Caribbean cruises will have more time to get to Miami this summer, because NCL has changed the sailing time from 4pm to 7pm. The change applies to eastern Caribbean sailings (not western, on alternate weeks) from May 7 to December 31, 2016. After Anthem of the Seas’ rough ride through a storm less than a month ago, the line said they had more resources and new procedures in place to make sure it doesn’t happen again. Apparently that new level of cautiousness is already coming into play because Royal Caribbean is returning Anthem of the Seas from its current cruise to keep it well away from a storm it would have encountered on its return should it have kept to schedule. The line said on Saturday, Anthem would be skipping its last two ports of Barbados and St. Kitts and heading home to New Jersey right away in order to stay what is now considered a safe distance away from the storm which is predicted to create hazardous seas and has now produced gale warnings. Details appeared in the February 29 edition of Cruise News Daily. In China, names are important. With that in mind, Norwegian Cruise Line has chosen not only a name for their purpose-built ship which will be based there, but also a new name for the company in China. The ship, a Breakaway-plus ship will debut in China in a homeport still to be announced, in the summer of 2017. 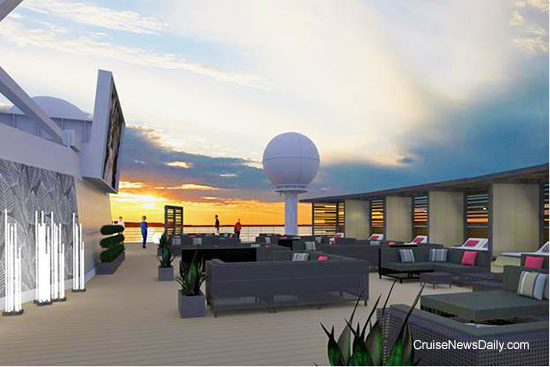 The complete story appeared in the February 29 edition of Cruise News Daily. Following the destruction in Fiji caused by Cyclone Winston last week, four Carnival Australia brands have announced they are resuming scheduled to Fiji. In addition, Carnival Australia has donated $125,000 to Save the Children, Australia’s Fiji relief efforts.